This video clip is the presentation of BELLA GAIA project 'Beautiful Earth'. The project deals with a mutual influence of ecology of our planet and human civilization in time and space. 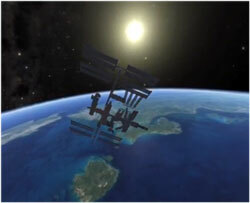 Earth images and digital video effects used in video clip belong to NASA. Composer and director: Kenji Williams. When undertaking its scientific and research mission (including photography of planetary surface necessary for making of satellite maps), the International Space Station moves along its orbit. The Earth looks very beautiful. But what is it? Is it true that now thousands of artificial satellites are moving around the planet? Are the hundreds of airlines connecting cities and continents? The video clip briefly shows the progress of mankind. It demonstrates ultramodern technologies and their side effect on the ecological system of the Earth: oil spills, burning forests and jungles, and melting glaciers. Video length is just over 8 minutes. However in this interval of time the viewers will be afforded an opportunity to realize that our planet is a part of the Universe, where all occurring processes interrelate. The movie quotation: 'People of the Earth have no another place in the Universe, which they can call their home'.